A depleted Marlins started the game with 11, having lost a few to the twickenham cheerleading posse, and were augmented by a few subs begged and borrowed from the opposition. Old Cats, put out a youthful side, and equally PJFRFC were boasting four new fisher school leavers, though were still reliant on half a dozen “super vets”, both in age and calibre! Marlins has several spells of good possession, and played a significant spell of rugby in the opposition half, especially in the second half, though lack consistency in their line up, to enable any pattern to emerge. Further, some crucial injuries in the first half, to Billy, Morgan, and Kian, made this an up hill task. Marlins struggled with the set pieces, as 3 of the front five were borrowed, and so did well to secure as much ball as they did, largely thanks to good discipline, inspired by their youthful stand in captain Kian MacNulty, aided by the veterans. PJFRFC marlins were put to task from the word go, and some sloppy defending led to Old Cats scoring in the first 10 minutes, to lead 12-0, though some measured leadership from the front, through tough ankle shackling tackles by Jules, Jamie Velderman and Towering Tony, soon had Old Cats in their back foot. This enabled Simon Cripps, playing fly half, to dictate for short spells, and put Jamie Velderman and Rowan Fernando in space. Jamie and Rowan made a few good forays into opposition 10 yards , and were unlucky to score, though the lack of regular forwards began to show, when ball was turned over, and individual ball carrier’s isolated. Old Cats utilized spilled ball to launch counter attacks, and score, to lead 19-0. The re-start led to a dropped ball by old Cats, and Foxy at scrum half, had his kick charged down from the ensuing scrum, and Old Cats led 26-0. Marlins stepped up their game and held Old Cats for long spells, with young fisher leaver’s Kian and Ryan, making 30-40 yard runs, carving out the defense, again unfortunate to score, and again the lack of third & fourth phase support play, let them down. Again, lack of regular forwards, made it difficult to compete at the line outs and scrums, however PJFRFC marlins, made the most of the opposition spilled ball, and kept taking the game to Old Cats. However, Old Cats, kept their cool, and utilized their forward power to make the hard yards, and score two further consecutive tries, and lead 38-0. Half time brought much needed reprieve to the Marlins, as two of the borrowed front row decided to retire, and scrums were uncontested. This enabled PJFRFC to attain more possession, and thus Simon Cripps was able to utilize the breadth of the pitch, and let loose Jamie Velderman, and further out wide utilizing Ryan and Rowan, to make good yards. Aided by Towering Tony Mawer, popping up at just the right time, to support a quick penalty for hands in the ruck, and score, and come back 38-7. The second half was evenly poised, with again borrowed players and new comer Richard Pennington, stepping up to the mark, and making the hard initial yards. PJFRFC did well to hang onto possession, supporting the breakdown, and with good interplay between forwards; Jules, Tony, Morgan, and backs; Amantle, Rowan and Ryan, and were rewarded with another try, culminating from free flowing rugby, with Simon Cripps shimmying his way through a few forwards, to score under the post and come back 38-12. 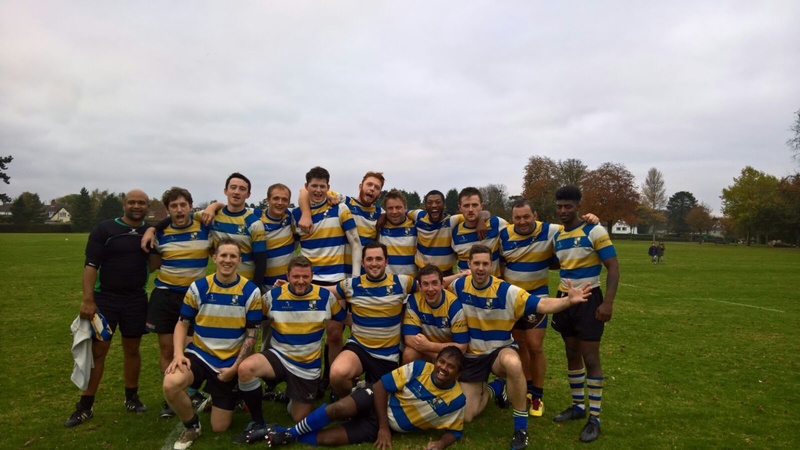 The super vets were running low on steam, and some fresh legs brought in by Old Cats, ensured that they did not lose the second half, and score two more tries , and lead 52-12. Marlins will be pleased with the recruitment of youth, especially John Fisher school leavers, but paid the price for missing several forwards, this made it difficult to conpete in the set pieces. Marlins are almost half way through the season, and would need to pick up their game, in order to finish mid-table.